As the dredging work approaches completion at Largs Pier, the little grab hopper dredger RAMSGATE was seen at work on the south side of the new pier. Little remains of the old masonry pier, which dates from the early 20th century, and was itself a rebuild of a pier constructed in the 1830s. 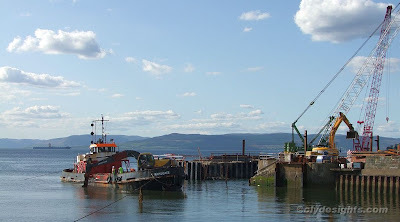 The rebuild of Largs Pier is scheduled for completion in July, and will permit overnight berthing by the two regular Largs ferries which, for the moment, are having to lie at Fairlie Quay each night.